It all boils down to a single question: Confronted with a crisis what is the artistic impulse. Is it to dive head long in and record suffering for future generations? Is it to forget the crisis? To fill us either with beauty or laughter? Or maybe fight for survival? — the playwright explaining his effort to show how people, especially those in the arts, have responded to major crises through the centuries. Jordan Harrison is certainly one of the current theater's most interesting voices. After venturing into the realm of the near future with Marjorie Prime (Nominated for a Pulitzer Prize after its run at Playwrights Horizon and made into a much lauded film), he's turned his fertile imagination in the opposite direction— all the way back to the 14th century when the Black Plague was decimating Europe's population. The title of his debut work at the Vineyard Theater refers to a group of traveling pageant players whose theater consists of a wagon they drag from town to town. It was the only way for actors to work since the deadly Black Plague had caused theaters to close. Harrison's triple-decker, meta-theatrical attempt to link that long ago crisis to the AIDS epidemic and more current catastrophies can't be faulted for lack of ambition. To help him realize that ambition, the playwright is supported by truly inventive stagecraft and a top notch cast that's sturdily directed by Oliver Butler. Clever and amusing as all this is, for some like me, The Amatuers is a bit too ambitious for its own good for the two distinct theatrical styles coalesce and mash its intermissionless parts into a completely satisfying 3-act play. All six actors fluidly navigate between their roles as members of the troupe and in the play within the play. Backstage wizards David Zinn, Jessica Pabst and Raphael Mishler should also be brought out to take bows. Zinn has covered most of the stage with a mound of black earth and supports the play's plot with a single prop — an easy to move wagon theater that magically opens up to create some genuine magic. Jessica Pabst's costumes and Raphael Mishler's masks and puppets reinforce the era's look and theatrical performance style. 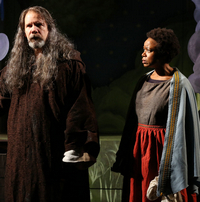 The approximately forty-five minute long first act establishes the personalities of the traveling theatrical group as they rehearse a new production of the biblical mystery play Noah's Flood. The enactment of the Seven Deadly Sins is great fun and might just help the company to win what for them would be as gratifying as winning a Tony: To please the Duke of the town where they're headed enough to offer them a steady, safe haven from the plague that's killing thousands daily. Larking (Thomas Jay Ryan), the bossy leader of the troupe naturally gets to play the principal role of God. A pivotal female ensemble member is Hollis (Quincy Ty[er Bernstine), Larking's wife (and Noah's in the play within the play). It's her beloved brother Henry's death and her overbearing husband that ratchets up her questioning God's actions as well the way she's directed to play her role. That death also leaves Noah's Flood short of an important character and the troupe's bad girl Rona (Jennifer Kim) pregnant. Another actor, Brom (Kyle Bertran) reveals his uneasiness with his sexuality and Gregory (Michael Cyril Creighton) adds humor as an early version of a prop designer. The vacant acting slot is filled out when the always terrific Greg Keller shows up as a mysterious Physic or doctor. Ryan and Keller are especially interesting to watch since these are very atypical roles from those they've played in the past. What happens instead of the intermission in a conventional two or three act play is a welcome shift from the grimness of the plague ridden world on stage, does, for all its wit, also misfire. To avoid going into spoiler mode, I'll just say this is a fourth wall breaking interlude that slyly points a scolding finger at Larking for having kept Gregory backstage hammering out props because he doesn't think he's got what it takes to be a performer. While Michael Cyril Creighton does indeed make the most of a more up front and center turn, but it tends to feel like combination a stand-up comedy act and lecture that doesn't integrate all that hilariously into the overall story. This section, during which the lights are turned on, also includes a similarly out of sync, and actually better, monologue for Quincy Tyler Bernstine (In case you're wondering why Heidi Schreck is credited for contributing additional material, it's Bernstine's text here that's her contribution). When this middle act returns us to the main story line and style, we presumably have a better understanding and appreciation for Mr. Harrison's intentions. My problem with this set-up is that a play should reveal its meaning and mission without any extra "contextualizing." My nitpicks aside, The Amateurs does make interesting points about artists' persistence to carry on and grow through the ages — especially in terrible times. Futura, a previous venture into a futurist world. Cast: Kyle Beltran (Brom), Quincy Tyler Bernstine (Hollis), Michael Cyril Creighton (Gregory), Greg Keller (The Physic), Jennifer Kim (Rona), Thomas Jay Ryan (Larking). From 2/08/18; opening 2/27/18; closing 3/29/18.